Fritz is not selling intuition or mystical theory. He believes that you and I can really learn how to create what we desire to be or to do. There is a learning process that can be used to explore and attain your ends/goals as a creative person. Yesterday I began by looking at some of the fundamental principles he provides. A major hurdle to creativity is the reactive-response orientation. He concludes: “Parents understandably want their children to avoid negative consequences. But the strategy of avoiding trouble is taught and reinforced until it can become an automatic lifetime habit” (17). We were taught, by various lessons we learned as children, that “circumstances” are the dominant force in our lives. Most psychology, especially pop-psychology, underscores this powerfully in contemporary culture. The church is most definitely not immune to this thinking. The basic premise behind it is that we are fundamentally powerless. As I noted in my conclusion yesterday, problem solving kills creativity as much as any single human pattern. Problem solving is sometimes needed. We face serious problems and must address them. But at best problem solving brings temporary relief, solutions that will likely lead us back to problems that we must solve again and again. Final success lies elsewhere, which is where creativity and vision connect. Fritz uses an example taken from solving a food and water shortage in Ethiopia. Relief solves many problems but it does not give long term answers. The intensity of the problem drives it and once a solution is offered people are then less motivated to act. Thus, “problem solving as a way of life becomes self-defeating” (35). Creating is more like actual fishing. Before you go to the pond, you focus on the kind of fish you want to catch. If you want trout, you bring fly-casting equipment. If you want bass, you bring sinkers and bait. There is always an unknown quality in the creative process, as there is in fishing, but when you are aware of the final result you want to create, you are able to focus the process, rather than make the process a random one (39). Medicine gives us another model that illustrates the point Fritz is making here about the difference between solving problems versus creating. The medical model is focused on solving problems. Observe the symptoms, diagnose the causes, and prescribe solutions. In the world of psychotherapy this model is dominant. Find out what is wrong and fix it. I have found the same to be true inside the church. Most leadership is focused on solving problems. Find out what is wrong and then work to correct it. This kind of leadership is called for in every social realm that we live in but it will not lead to creative focus and process. Medical science is not a method for creating health. Newer trends in modern medicine are learning about holistic health and thus borrowing ideas from other approaches in science and study. This has led to a new emphasis, especially over the last decade or so, on not just alleviating disease but on creating good health. A simple illustration of this can be seen in the rise of nutritional information and teaching on better health. It is essential that a clear distinction be made between problem solving and creating. “The reason that this distinction is important is that most people are truly interested in creating the lives they want to live. Problem solving does not enable them to create what they want and often perpetuates what they do not want” (41). 1. Conceive the result that you want to create. Don’t start anything until you are entirely clear what you want to see as the result of the process. Knowing what you want is an acquired skill since most forms of education encouraged you to adopt “correct” responses, not a response that most people cannot see yet. 2. Know what currently exists. If you are painting a picture then you need to know the current state of the painting as it is being developed. Know what you’ve created so far before you take the next step in the creative process. View all reality objectively. In music conservatories students are taught to identify rhythms, harmonies, and intervals by hearing them. This skill is called “ear training.” All creative people need to develop this skill. 4. Learn the rhythms of the creative process. There are three distinct phases of this process. First, germination. This begins in excitement and newness. This often comes from the unusualness of the new activity. Second, assimilation. The thrill is gone so in this process “you live with your concept of what you want to create and internalize it. It becomes part of you. Because of this you are able to generate energy to use your experiments and learning” (54) Third, completion. This stage applies the energy of the first two stages to the creation itself. You seek to bring your goal to final completion. As completion comes you are energized to germinate your next creation. Each new creation prepares the creator for a new success. It adds experience and knowledge of your own creative process. This process can be learned and taught. If you understand it you can focus on an outcome others cannot see and pursue it with faith. But why would you create anything? I’ll answer that tomorrow. Gretchen Wood McDaniel liked this on Facebook. Benjamin Wechsler liked this on Facebook. John, thanks for posting this interesting series of articles. I have occasionally been listening to online sermons by Greg Boyd. Lately he has been exploring the meaning of prayer. Many Christians think of prayer in terms of bringing a felt need or problem before God and asking him to move some people and things around to solve the problem. But prayer, as Boyd explains it, has much more to do with envisioning a desired future outcome, dwelling it in with imagination, and sharing in God’s creative energy to make it happen. He explains this using the repetition of the Greek word energeo in James 5:16. 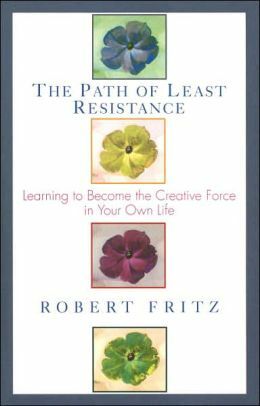 I’m wondering if you have thought about this, and whether you will explore any connections between the ideas of Fritz and the meaning/practice of prayer. I’m enjoying these posts John. Developing a context to be creative is one of our great needs at this time. We have lived off past creative capital for too long. We need a lot of new ventures in every field. John, this seems to be a very important point. In my own short journey of Christian Unity so far, I have concluded that the key ingredient of Christian unity is humility. It allows us to learn from those with whom we disagree. It allows us to trust Jesus Christ to build His church and choose whom He will welcome in. And I agree with Joseph’s thoughts above, that God is always inviting us into His creative kingdom work, and that humble prayer and creativity are ways for us to follow Him where He is leading. I’d say the creativity is especially important because we usually cannot predict where God is leading, so our problem-solving skills are not effective here. Thanks for your thoughts and humble reflections! thanks for this John! this isn’t the first time I’ve bought a book on your recommendation! Forrest, it is a bit too wordy and tedious but the basic idea is life changing, or so I think. Sounds like a gold vein in a ton of quartz.